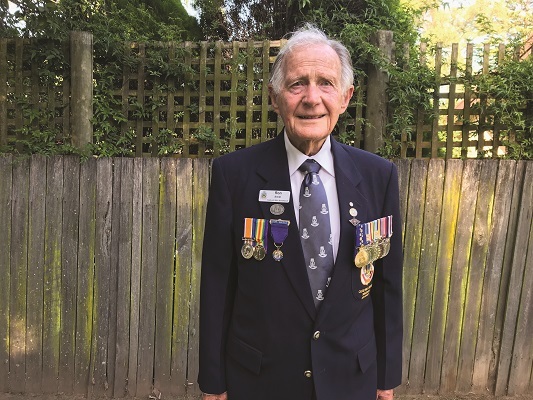 RON SMITH was 18 when he joined the Royal Australian Navy in 1948. He had been an army cadet during the war and his older brothers were serving in the RAAF. His mum was not happy when her youngest son enlisted but for Mr Smith, who was born and raised in Castle Hill, it was all he had ever wanted to do…serve his country. His 22 years as a serving officer was followed by 24 years as an instructor at the Royal Australia Navy teaching establishment at HMAS Nirimba at Quakers Hill. After completing his training, he joined HMAS Australia which was sailing around Australia, visiting the country’s major ports to allow people to see the battlescarred warship. According to Mr Smith, crowds would flock to show their gratitude. “She survived more attacks than any other Australian ship during the war, the shrapnel marks were clearly visible,” he said. The next tour of duty was as a party of three on the remote Montebello islands where they spent 30 days measuring the tides. He said they had no idea they were providing details to the British who were planning to undertake nuclear testing on the islands. He’s next deployment included 12 months on Manus Island at a Naval Base where Japanese War Prisoners were held. Deployments to Singapore, Malaysia, Hong Kong and the Philippines followed. The most clandestine operation of all though was with HMAS Sydney which took the first major deployment troops and vehicles to Vietnam. His Naval career also saw him working at HMAS Nirimba in various roles and when he was offered an instructor’s job he took it, moving out of uniform as a Chief Petty Officer into a instructor’s role at HMAS Nirimba in 1969 where he taught electrical trade skills to thousands of young service apprentices over a 24 year period. He has been a member of Castle Hill RSL since 1968, although had been attending meetings for years before that, and joined the Castle Hill RSL subbranch in 1973. He is the longest serving Castle Hill RSL Club director following his election to the board in 1975 and subsequent re-election ever since. “To me ANZAC Day is part of the Australian Tradition. He attends all the ANZAC day services and has also created a memorial garden at Castle Hill Public School for two former students who lost their life in World War II, Pilot Officer Herbert Watson Parkinson who was just 20 when he died and Leading Seaman Morris Hughes who died aboard HMAS Australia.